Team Noramise, comprised of six Orcas Island High School students and two former graduates, together with Rosedanie and Steve Diepenbrock, began their trip to Haiti via Brooklyn, NY where Susan Daily of Chestnut Restaurant hosted a benefit. Ms. Daily donated 50 backpacks for the children of Limbé, and her children and their classmates filled them with school supplies. These were entrusted to the Orcas students who would deliver them. On arrival in Limbé the team hosted the first 2-day art and sports camp for the youth of the town. A second visit was made to Bethesda School where, with the help of Mrs. Batat’s sons and several community members aged 8 to 30, they cleaned up the back yard and built beds for a vegetable garden which the school will maintain. Building and stocking a chicken coop is scheduled for the next Team Noramise trip. Team Noramise also worked with a Haitian school group to clean the grounds of the local museum. Helping Hands Noramise now has a local Haitian committee which will oversee projects when the U.S. team is not present. Mrs. Grimard will act as Directrice, and Mr. Desronvil as Secretary of this committee. A house was found to use as a headquarters, and through the generous support of an Orcas Islander, it was leased for one year. This will be the place where the local committee will meet with project leaders. It will also house the U.S. team and provide a home for a burgeoning local artists’ cooperative, Tambour Arts. The house is three doors from the childhood home of Rosedanie. The trash pile in the marketplace has been removed due to the influence of the Minister of Agriculture. On the final day of the trip Rosedanie, Mrs. Grimard, and Mr. Desronvil met with Mayor Celicourt Monpremier to discuss continued cleanup of the town. Team Noramise has offered to help by providing community outreach and education on the subject. We trust this is the beginning of a long and beneficial partnership with the local government. On return to Orcas Island, Team Noramise made a presentation to the community at Emmanual Parish Hall on July 27th. The team members spoke about their experiences in Haiti and what they had gained from the trip. They presented a 30 minute slide show which received a standing ovation. A “Golden Shoestrings” auction capped the evening and helped to defray some expenses of the trip and to support the ongoing projects. It was concluded that the exchange between the youth of Orcas Island and the youth of Limbe’ was priceless. Team Noramise arrives at house in Limbé, Haiti, with lots of gear & supplies. The first Orcas-Limbé student exchange is happening! 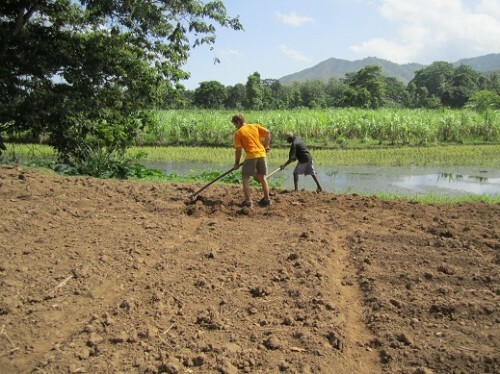 Volunteers are working on land in Limbé which has been dedicated for the construction of a tuition-free vocational high school to be built by Team Noramise and a local family. See recent PHOTOS taken by the group in Haiti on the Noramise Facebook page. Thank you to all the people who donated time and money to support this trip! The summer solstice fundraising benefit event for the school project in Haiti, held at Chestnut restaurant in Brooklyn, NYC, was an amazing send-off party for this group of student volunteers. Thanks to the generous owners and chef of Chestnut who donated the delicious food and beautiful space! Steve doing what he loves best, Limbé, Haiti.